The terrace of the Hotel REC Barcelona, in the neighborhood of Sant Pere, Santa Caterina and La Ribera, a social space where you are the protagonist! A terrace with pool, cocktail bar, lounge area and spectacular views of Barcelona next to Arc de Triomf. 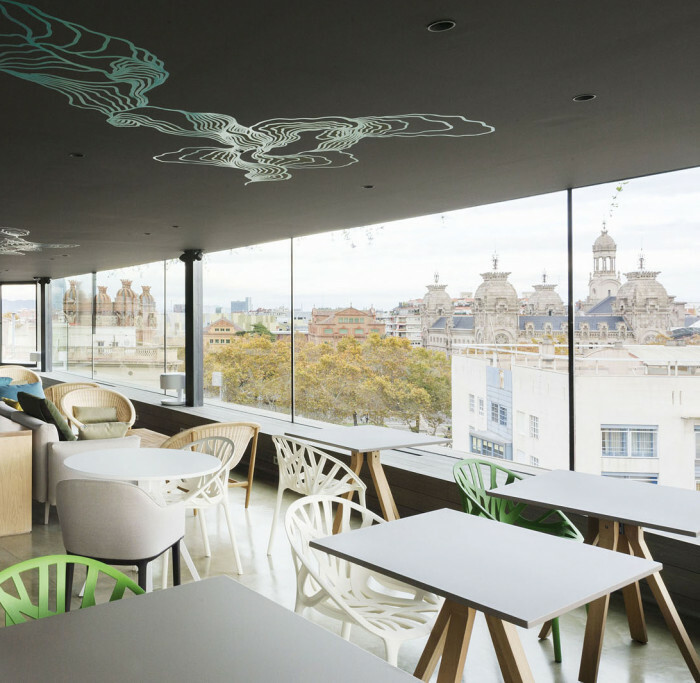 The REC Lounge is a unique space, a cozy area open to the outside on the 7th floor of the Hotel REC Barcelona, which allows natural light throughout the day, thanks to its large windows. This area, completely devoid of barriers, offers hotel guests a transparent environment in a comfortable living where you can start the day with breakfast or end the day, enjoying some wonderful tapas and cocktails. In addition, the REC Lounge has an area with terrace, pool and solarium with spectacular views over the neighborhood of Sant Pere, Santa Caterina i la Ribera, one of the most alternative neighborhoods of Barcelona.